A group of students enrolled in the Community-based Project Module (JCP), the compulsory undergraduate course of the Faculty of Engineering, Built Environment and Information Technology did their project at Opkyk Pathways near Hartebeespoortdam. One of the learners is unable to walk and suffers from 'drop attacks'. This means that he could faint uncontrollably at any moment. Although he is able to crawl, that type of movement exposes his face and causes severe injuries to his facial area in the case of a drop attack. He has the ability to 'kick' on a kicking bike, but his immobility caused a significant increase in weight and his plastic kicking bike, designed for kids, are not durable enough to support his weight and they break within approximately a month's of use. 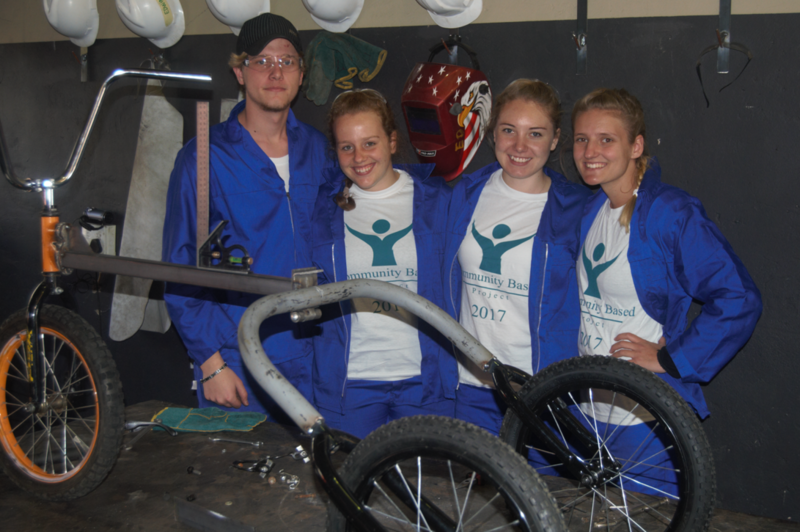 The students, Danielle Coetzee (Chemical engineering), Cherise Horn (Metallurgical engineering), Franco Janse van Rensburg (Mechanical engineering) and Handri Steenkamp (Metallurgical engineering) therefore decided to design and develop a tricycle for the learner. The students reflected afterwards on how one small thing could make a difference in someone's life and that In the process of changing someone else's life, you also change your own by enriching your heart and changing the way you look at life. Pleaseview their YouTube on their project.